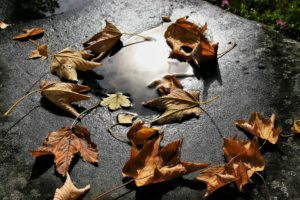 Autumn is here and at the programme office we are working on the updates for the STRIM’s strategic roadmap, which you can read more about in this newsletter. We have also hosted the annual SIP conference in Kiruna, where all 17 strategic innovation programmes met together with Vinnova, the Swedish Energy Agency and Formas. In addition to networking, discussions and exchanging experiences, we made a highly appreciated visit to the mine at LKAB’s Visiting center. We are pleased to welcome our new communications officer Terese Mella to the programme office. She has extensive experience of research support, communication and events from the research institute Swerea MEFOS. And finally, we hope you haven’t missed that we are active on LinkedIn and Twitter, so please follow us there to stay up to date with the latest news! The foundation for the Strategic Innovation Programme STRIM is the strategic innovation Roadmap that has been established in collaboration with the industry, institute and academy. The roadmap defines visions for nine thematic areas related to primary and secondary raw materials. The research and innovation is defined in the short, medium and long-term – based on key indicators. All areas have defined actions that can be implemented within national and international initiatives for research, development and innovation. The first roadmap was published in 2013 and since then it has been revised once. Now we are about to update the roadmap for the second time. The work is based on the industry’s upcoming challenges and driving forces. During August and September, a series of workshops will be. 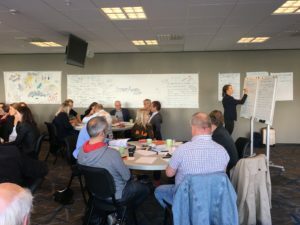 The first workshop was conducted at the end of August and specifically addressed to the boards of Svemin, Bergforsk and SIP STRIM where we focused on motivations, challenges and visions. The result of the visionary workshop will be used as input for the two upcoming open workshops. In the first workshop we will elaborate on the visions and challenges that emerged in the meeting with the boards. In step two, important inputs from the thematic areas are to be panned out. The process of writing the new roadmap starts in October. A writing workshop with the thematic leaders will be held on October 8th. The roadmap will be finalized by the turn of the year and will be presented at the Future mines and minerals conference in Stockholm in January. 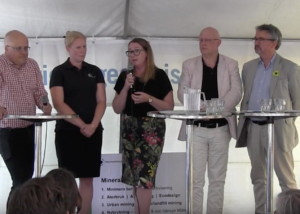 SIP STRIM visited this year’s Almedalen Week to talk about sustainable raw material production and sustainable transformation in the mining industry. Read more about this and watch the videos from the seminars here. We have interviewed some of our partners about the benefits of SIP STRIM. 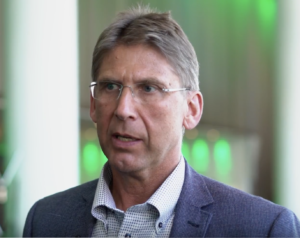 Listen to Jan Moström, CEO of LKAB about the importance of SIP STRIM for the Swedish mining industry (in swedish). The annual open call will close on November 7th. The call concerns shorter preliminary studies, full-scale innovation projects or pilot projects addressing the challenges defined by the SIP STRIM Agenda. Read more and apply here. The strategic innovation program STRIM and Vinnova invite all operators who currently have, or have had, projects financed by STRIM to seek planning grants for the exchange of their projects through international initiatives. The call will close on November 8th. Read more and apply here. Do you want our newsletter directly in the mail in the future? Subscribe here.